Starting a small food business isn’t easy; high start-up costs and strict regulations can prevent even the savviest of small food entrepreneurs from realizing their dream. If you live in California’s Coachella Valley, however, starting a small food business has gotten a bit easier thanks to ShareKitchen, a commercial kitchen incubator in Cathedral City. Angela Janus started ShareKitchen in 2012 after years of watching her friends in the food business struggle to get good ideas off the ground. Janus, who had 25 years of experience in the hospitality and food industry, recognized that there were many barriers to starting a small food business, some of which were too hard for small food entrepreneurs to overcome on their own. Janus decided it was time to break down these barriers for small food entrepreneurs, but she knew she couldn’t do it on her own. Rather than turning into a start-up business casualty herself, Janus decided to engage the community and collaborate with local organizations that could help turn her vision for small food entrepreneurs into a reality. One of Janus’s most strategic partnerships was with Cathedral City. After six-months of looking for a kitchen space for her project, Janus received a tip from the Health Department about an abandoned building that was the former location of a high-end supper club. The building had recently been purchased by the city, and since Janus had already been networking with local municipal organizations to gain support for her project, they already had some level of awareness about what she was trying to accomplish. Although the building was in total disrepair, Janus recruited the help of some contractor friends to get it in tip top shape before ShareKitchen’s official launch in October 2012. When ShareKitchen opened, there was a waiting list of small food businesses eager to use its space. Over the past two and a half years, ShareKitchen has had as many as 17 businesses working communally in its space at one time. Six of these businesses have since grown into full-time operations, working full days in the shared kitchen. Three of these businesses are ready to strike out on their own, independent of ShareKitchen, which, according to Janus, is the ultimate goal of the organization. “They’re hiring people and getting ready to transition out into the community this year into their own facilities. We are very excited and we are very proud of the work that they’ve done and most importantly they are creating jobs,” says Janus. ShareKitchen provides its clients with a shared kitchen space, individual dry storage space, pots, pans, and other kitchen equipment. ShareKitchen even offers access to a storage unit that contains catering supplies like pop-up tents, tables, and coolers. In order to prepare small businesses for the eventual goal of independent entrepreneurship, ShareKitchen also offers business mentorship (both general and industry-specific) through a partnership with a local business center and hosts collaborative workshops with other organizations. Janus believes that by providing these resources to small food businesses she is ensuring their chances of success, and based on statistics, she is correct. According the National Business Incubation Association, 87 percent of small businesses that come through an incubator like ShareKitchen survive, as opposed to the 44 percent survival rate among businesses who don’t have incubator support. In the future, Janus wants ShareKitchen to keep playing the same role it is now— only in a larger capacity. 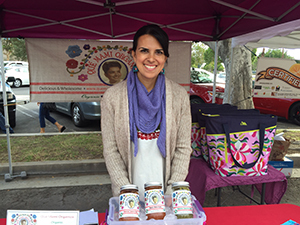 She would like to form partnerships with organizations beyond the Coachella Valley and create a regional food network that is supportive, collaborative, and that helps small food businesses thrive.